Beldum, Aerodactyl, Bulbasaur, Charmander, Squirtle, Cyndaquil, Totodile, Chicorita, Eevee, Absol, Gible, and probably a lot of others... just let me know what you want. I'm also interested in shiny pokemon but would prefer the legendaries above. If you have a shiny legendary above then I'll likely trade anything. Anyone and Everyone is free to add my friend code. I need some pokemon to help finish my dex!!! I have alot of Phiones if anybody wants one! And pretty much everything else I didnt mention in the needed. PM me with Offers Please! Last edited by Jun XIII on Wed Jun 23, 2010 10:27 am, edited 13 times in total. I will be fine with a tradeback for any of these. Shiny Chingling(lv15) but how legit it is, I am unsure. This is my main selection that might be worth while to look at. As everybody else, I do have more than shown. PM me to trade. Last edited by MAXC00L on Wed Jun 09, 2010 9:51 pm, edited 8 times in total. After breeding for natures and IV's, I have hordes of 30 speed iv aipoms. I can give you one but you have to breed for the nature/egg moves your self. (You just give it a power anklet and it will give the iv to the baby but it only works with females). What I want is a Modest natured Houndour/doom, or a Makuhita. PM me if you want to trade. Last edited by Scizor Rules on Sat May 22, 2010 7:41 am, edited 1 time in total. Do you want a 31 speed IV aipomb to breed with? I want to complete my hitmon collection! and are what I want besides scizor. Ok, trying to complete my pokedex on my Pearl version. I got access to almost all the pokemon I need thanks to my Soul Silver version along with all my old GBA games, but there are still a few I need... namely the event only legendaries. I will trade back ALL of these, I'm only looking for Pokedex entries. Similarly I couldn't care less if they're hacked or whatever so long as they won't harm my game somehow. If you're worried I wont trade them back, feel free to clone them and hand me a clone. Shiny lv 85 Parasect with maxed Def and Spec Def EVs, moveset optimized for pokemon catching. (was bred and trained specifically to catch legendaries) Nevermind, realized I can't make myself give him up. EDIT!!!! my offer just got a lot sweeter... My team just got infected with the Pokerus! So now, I can also infect any pokemon you like in return for anything on my list, and my tradeback offers just got sweeter since I can infect your legendaries for you! Last edited by Jimera0 on Tue May 25, 2010 5:16 am, edited 1 time in total. I have a bunch of porygon, ditto, and eevee's if anyone is interested, caught them all myself. Also an upgrade I might be willing to give up for the right item. Multiple: Bulbasaur w/ Leafstorm - generally high IVs. Multiple: Chimchar w/ Fake Out, Blaze Kick, Iron Tail. Usually w/ 1 max IV or more. * Make me an offer. I am also looking to obtain the Azure Flute. I'm also interested in shiny pokemon but would prefer the legendaries above. If you have a shiny legendary above then I'll likely trade anything. If I dont have a Legendary posted I own it so I could trade that for a shiny legendary. Beldum, Aerodactyl, Bulbasaur, Charmander, Squirtle, Cyndaquil, Totodile, Chicorita, Eevee, Absol, Gible, Bagon, Torchic, Piplup, Omanite, Kubuto and probably a lot of others... just let me know what you want. just PM me when you'd like to! Alright I got enough changes now I might as well just repost. Lots of TMs and items, but no master balls and I may not be able to give up some of them. 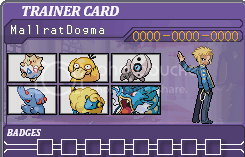 Added bonus: I have the Pokerus virus and can infect any pokemon you want for you. Also note, I may have difficulty cloning at first, I haven't tried it out yet but I'm *assuming* I'll be able to figure it out eventually. Last edited by Jimera0 on Wed Jun 02, 2010 4:39 pm, edited 1 time in total. I want to do a tradeback with those pokemon. I also want to evolve some of my pokemon that need to be traded to evolve: Politoed or Slowking( i only haveone king's rock, so if anyone wants to give me on that would be nice), Scizor and dusknoir. Last edited by Ossi on Fri Jun 18, 2010 3:36 am, edited 3 times in total. Last edited by ak107 on Mon Jun 07, 2010 5:27 pm, edited 3 times in total. I have 22 extra Shiny Eevees of different natures and genders. They are not clones, they are all different. I am accepting 6 nuggets or an event or an UT legendary in exchange for one(We can barter over price - but this is the main listing). 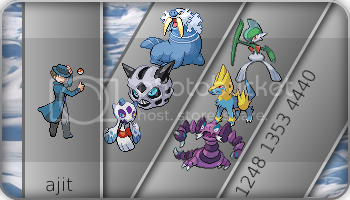 If you are interested in one (I do know the IVs of all of them) Please PM me and we can set something up. I also have other extra shinies, as well as Lvl 71 pokemon that I cloned and tried different movesets on. I know the Ivs and the Evs of these(My Shiny Blue Silver Team)tests: Gallade, Garchomp, Mantine, Electrode and Shuckle. I'll take 3 nuggets for any of these or again try bartering. Last edited by MallratDogma on Sun Jun 06, 2010 10:58 pm, edited 1 time in total. A Dubious Disc and someone with freetime to help me evolve. Rare Berries, Power Items, a Master Ball, and certain TMs. PM if you can help me out. I just need someone to trade me a Dubious Disc and then help me evolve my Porygon2. And don't PM to offer a Porygon-Z, I want my Porygon-Z. Not someone else's.